CNN reports that Nicholas Negroponte of MIT has steered the One Laptop Per Child project one more step towards reality as its heads for production in 2007. 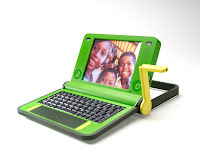 The OLPC project website states that this laptop would be ‘a potent learning tool created expressly for the world's poorest children living in its most remote environments’. These laptops are being called XO Machine and they are being made for world’s poorest children. These machines are extremely unconventional. They have a handcrank in case the battery wears down, and work on Linux OS and AMD 366 Mhz processor. Sorry, no harddisk, but instead 512 MB flash memory. XO machines would come with an inbuilt camera, and have a browser, and can quickly form a wireless network with similar machines in the neighborhood. What’s more, the OLPC project seeks to eventually produce such machines under $ 100 and seeks to distribute these cute machines to the poorest kids across the world though collaboration with the governments. However, these machines are not likely to be on sale in the markets, atleast not in immediate future. But trust me, no kid stuff this. Before I come to the second laptop, I want to talk about another project called Simputer which is again from the open source movement, which has moved to production stage. The Amida Simputer is being designed and marketed by Bangalore based PicoPeta and is billed as low cost handheld computing alternative for Indian environment where affordability is a major factor (heck, it is a factor everywhere). It operates on Intel StrongArm 206MHz SA-1110 Processor, 64 MB memory, weight 206 gm and has an inbuilt smartcard reader, USB and IR ports and work on Linux. Amida promises to read your handwriting as well and has an onboard mp3 player. It promises to run 8 hours on full charge. Pretty smart and promising indeed. Coming back to the laptop, here’s one that’s going to jolt you in your seat. 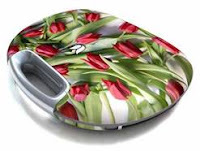 Welcome the Tulip Ego made by a Dutch company is more of jewelry than a computing device (read Rediff story ) the lower end model of which can set you back by $ 5.1 K. Now brace up for the real opulence, the Otazu Ego Diamond which can have 470 diamonds in 18 crt white gold setting. Ego laptops come with their changeable skins, which can cost upwards of $ 300 apiece. When not flaunting for the jewelry value, you can also use it for mundane stuff like sending emails, getting onto the web, and playing music. Well, three great projects, three unique value propositions and three very different user profile. And all projects very admirable indeed. good stuff abt the laptops... the XO one reminds me of the time i used to help my dad crank up the old amby! am sure Mr Maran may soon be doling out these laptops as part of Pongal or Tamil New Year gifts to the select electorate! Aishwarya & Abhishek, it is official!